Over a thousand discarded shipping pallets went into the making of this partly planted, undulating pavilion in New Delhi. 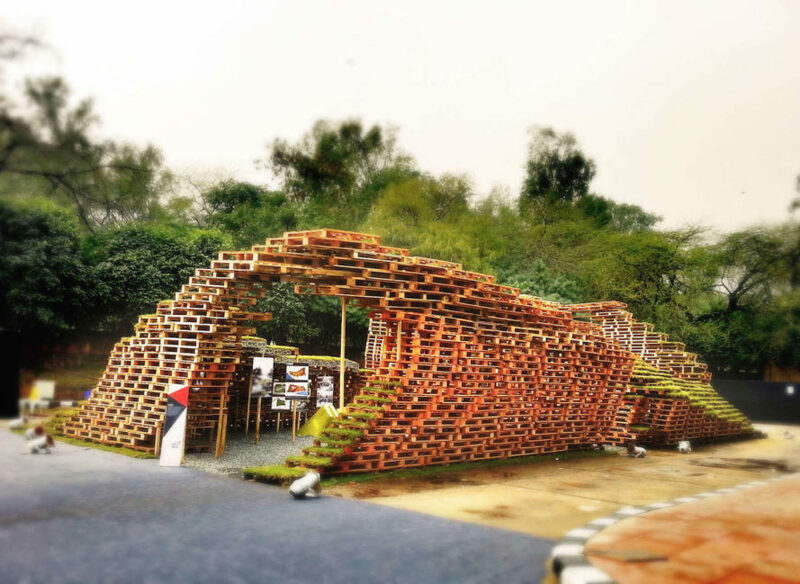 Local architecture firm M:OFA Studios drew inspiration from India’s ruins and their love of upcycling to create Pensieve, an award-winning experimental pavilion with a name inspired by the “memory basin” in J.K. Rowling’s Harry Potter series. The temporary installation served as an urban playground and public gathering space that inspired people to contemplate their surroundings. Built as part of India Design ID 2014, the Pensieve is no longer standing though it continues to be recognized in awards, such as its nomination in the Kohler Bold Design Awards 2016. Over 1,200 recycled pallets were stacked together in an asymmetrical shape inspired by the hundreds of stone ruins that dot the capital, where many locals used as playgrounds in their childhood. Compost added inside some of the open pallets was used as a growing medium for grass and other plants. “The concept initiated from the basic idea of ‘fluid’ thoughts,” write the architects. “Built out of recycled wood, this pavilion was asked on the idea of unobstructed thoughts associated often with the children. The pavilion became a reminder of those simpler times, where the kids looked at the world beyond a 4 inch by 3 inch display screen in their hands.” The large 800-square-foot installation framed a public gathering space that also included solar-powered furniture that lit up when people sat on them and a hundred fiber-optic sculptures that used motion sensors to light up at night. Over 1,200 recycled pallets were stacked together in an asymmetrical shape inspired by the hundreds of stone ruins that dot the capital, where many locals used as playgrounds in their childhood. Compost added inside some of the open pallets was used as a growing medium for grass and other plants. The large 800-square-foot installation framed a public gathering space that also included solar-powered furniture that lit up when people sat on them and a hundred fiber-optic sculptures that used motion sensors to light up at night.